I chose to do another Fishtail Braid Manicure but this time on my whole hand and using only Zoya Nail Polish colors from the Beach Collection which I won from the @RealBeauties “Mani Monday” contest a few weeks ago for this manicure HERE. It’s a really fun contest so I definitely suggest checking out their twitter and tweeting them your manicures on Monday, they always have great prizes!! 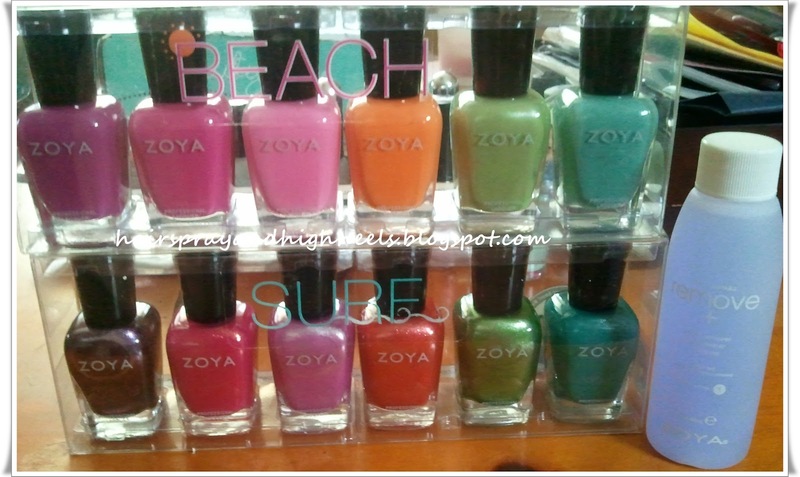 Before I show my manicure, I’ll go ahead and post a picture of what I won which is the entire Zoya Beach and Surf Collection and a Zoya Nail Polish remover, to say I am grateful is an understatement! How awesome is that? So excited!! Now let’s get on with the manicure! I just love the Fishtail Braid Manicure and using it with these bright summer colors made it so much better!! Want to get this look for yourself? It’s super easy to do, I promise!! You can check out my tutorial HERE and see just how simple it is. love the fish braid nail design! So cute! I love the mani. It looks great. And i love the colors that you chose. I have been seeing this around lately… I think I need to try it soon! It looks so cute! The fishtail braid is really nice. I love the orange color you picked this week. great manicure! I just recently learned how to do a fish tail braid (which i am so freakin proud of! lol!) i have a picture on my twitter @meetmissjackson if your interested. i may have to participate in the mani monday. prizes you say? ok! they have this type of mani over at the beauty department but they did it with tape. idk if you go to the beauty department but you would probably like it! I was inspired from them to do a faded floral mani that i did on my blog a couple posts back. btw your tutorial link (that says HERE) isn’t linked, girl! just thought i would letcha know so you can fix it and I can come back and check it out! I found you from the blog love therapy blog hop! love the blog! thanks for sharing! you did a fab job! This looks great! I’m going to check out your tutorial right now as I have to try this!!! The colors together are fantastic. And thanks for the heads up about mani Monday I would be floored to got so many Zoya nail polishes! Ugh, I always admire people who are patient enough to do amazing manicures like these. It looks great! Lookin’ good! Thanks for sharing! Wow love the pattern! One day I’ll be motivated to do something like that!